Controls the autonomic functions of the Functions of the body. Sends signals between the brain and the Spinal Cord. 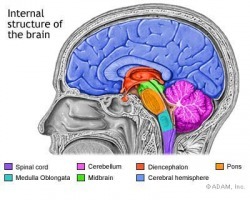 The Medualla Oblongata is located on the lower part of the brainstem. Assist with some of the autonomic functions. Controls arousal, send sensory messages betweem the cerebrum and cerebellum, and is also involved in the sleep process. They also have important centers for regulating breathing. Pons are a portions of the brainstem located above the medulla oblongata. Involved in coordinated the voluntary motor functions and balancing the equlibrium in muscle tone. The cerebellum is located above the brainstem and toward the back of the brian. It is relatively well protected from trauma compared to other parts of the brian such as the frontal lobe and brainstem. Damage to the cerebellum will result in movements that are slow and uncoordinated.